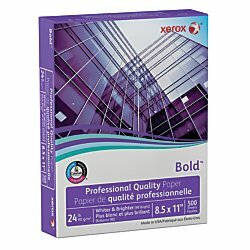 Xerox(R) Extra Bright Laser Paper, 8 1/2in. x 11in., 24 Lb., 95 Brightness, Ream Of 500 Sheets by Xerox at LDP Graphic Design. MPN: 3R13038. Hurry! Limited time offer. Offer valid only while supplies last. Great for important documents White 98 GE brightness. Features ColorLok(R) Technology for bolder blacks and vivid colors with ink jet printing. Great for important documents White 98 GE brightness. Features ColorLok(R) Technology for bolder blacks and vivid colors with ink jet printing. Smooth, thick white paper results in vivid colors and images. 99.99 jam free on high speed digital printing equipment Designed for use with most laser and inkjet printers. Precision-cut edges, smooth finish and dust-free surface ensure smooth processing. Forest Stewardship Council (FSC) certified - made from wood/paper that comes from forests managed to rigorous environmental and social standards, supported by the worlds leading conservation organizations. ColorLok(TM) technology for vivid colors, bolder blacks and faster drying.